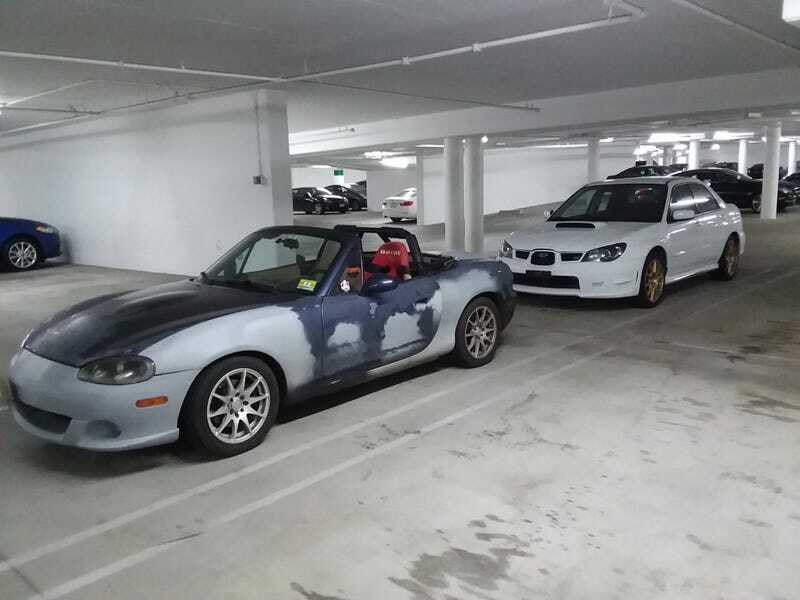 I had to take an Uber ride back to Burbank to pick up my Miata, go on a nice cruise with my girlfriend to enjoy the sunshine, and then set up my new parking spaces for the two cars. I got lucky in that my tandem spot has access from both sides so I don’t have to move one car to get the other out. Check engine light for the camshaft position sensor came back on again in the Miata, clearly advance auto sold me a crappy one but at least it has a lifetime warranty on it. The sensor made it 2000 miles without breaking though so it’ll be alright for now. Anyways, more photos of the cars together! And a bonus underhood shot of the STi! Oil and coolant are both good and where they belong. Couldn’t find much else wrong anywhere. The battery terminals were a bit loose which explains the slow power windows when the car was off, but once I tightened them it was fine. No washer fluid and I’m pretty sure that silly intercooler sprayer is empty. It needs wiper blades and a license plate light but that’s quite minor. I did find it neat that there is a button to adjust the height of the headlights. Not sure how useful that would be but seemed interesting. Looking forward to driving the car some more and my first commute with it on Monday.